Watch this video recapping our 2017 tour, as Debbie Brewin-Wilson sings her song, composed just for the occasion! 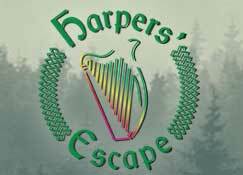 The Harpers' Escape is produced by You Gotta Have Harp Productions, 11 Country Lane, Voorhees, NJ 08043. Phone: 856-795-7637. Filled with anticipation to "Expect plenty of harps and history, breathtaking scenery, music and memories" the Harp Tour of Ireland set off on July 31 with tour organizer Marianne MacDonald and our trusty coach driver/guide Seamus Buckley leading 45 excited travelers from all over the US and Canada on a 10-day sojourn. I knew many from the Harpers' Escape and Somerset Folk Harp Festival and family and the others would become my new friends. Ultimately we clocked over 1000 miles, going to museums, ancient historic sites, and beautiful natural wonders. At the end of each marvelous day we returned to our world-class hotels and rose each morning to a hearty full Irish breakfast to set off for another day on our "Harpers Haj" filled with a daily dose of traditional music, harps and harp music. At our Shannon airport meet-up, we boarded our coach heading east to Dublin. After stopping to enjoy tea and scone at Killeen's Pub in Shannonbridge we went to our first historic site, the ancient monastic center Clonmacnoise in County Offaly. The churches and round towers go back to the 9th to 12th centuries and on one of its iconic stone high crosses (c. 800) we had our first non-pub harp sighting. It was an exciting beginning of our tour. Since of us had arrived a day or more early we weren't too jet-lagged to enjoy the ride as it traversed the Irish midlands with the off-again, on-again Irish rain. By the time we arrived at Trinity College in Dublin it started to pour. Rain coinciding with getting off the bus quickly became a tour joke. 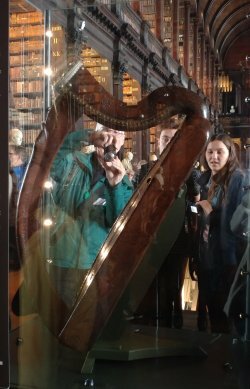 Our spirits were undampened though as we lined up to see the ancient Book of Kells and then up to the stunning old library to view one of Harpdom's holy grails, the Trinity College harp. Loyal readers of the FHJ already know this 15th century wire-strung harp, incorrectly called the Brian Boru harp. It was carved from a single block of willow and became the famous Guinness logo in 1862, and subsequently, the national emblem of the newly-declared Irish Free State in 1922. Jury's Inn Christchurch was home base for our 3-day Dublin stay, walking distance to many historic sites. Following a scrumptious dinner at the hotel, we had a get-to-know-you session, taking turns at the 3 harps we had, courtesy of Gráinne Hambly and Cait Buckley. Out came the fiddles, concertina, tinwhistles, flute and even a ukelele. 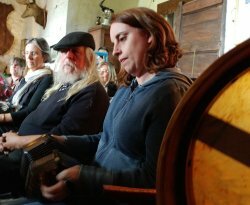 Tunes were traded, particularly Carolan's, and songs were sung. Seamus is quite the singer! Day 2 was a quick trip to the Guinness Storehouse, Ireland's top tourist destination. You already know about its logo. 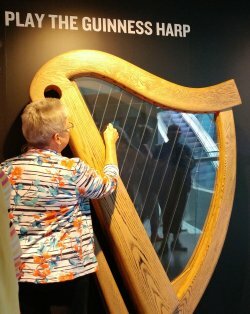 We were there to see 2 notable harps: the 18th century Downhill Harp played by Denis Hempson at the 1792 Belfast Harp Festival and the laser harp created by American harpmaker Glen Hill. Our greeter didn't know where they were located so we set off on a Where's Waldo-like harp search. The brewery exhibits were exciting but not as exciting as coming on those harps on the 4th floor! 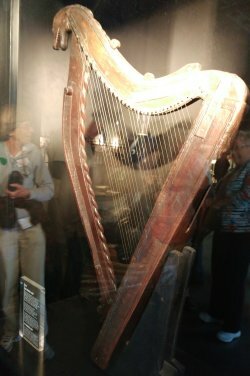 We played the laser harp and stood in awe in front of the display case containing the Hempson harp, probably to the chagrin of the other tourists wondering what the big deal was. Our reward for making it to the 5th floor was a stunning 360-degree view of Dublin city and the Wicklow Mountains—oh, and the complimentary pint of Guinness. After lunch we traveled to the megalithic passage tombs at Knowth, over 5000 years old, saw its great stone etchings, went to the tombs inside the Great Mound and then walked atop it for a stunning view of the Boyne Valley and nearby Newgrange. Seeing she had a guide dog, our tour guide invited Tracy Carcione to examine the stones, which she later described as one highlight of the trip, "It was amazing to... feel carvings that had been made thousands of years ago." When we got back to Dublin, everybody headed out to sample dinner across the city and find their own entertainment. 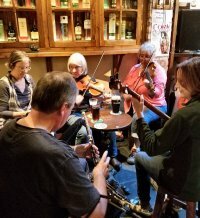 Nearly half of us ended up at the Cobblestone, a well-known trad club where Na Píobairí Uilleann (the pipers' club) have a regular recital every Wednesday night. Quite a few went to see the musical "Once" playing at the Olympia Theater. On Day 3 of #harptour, everyone got time "on their own" to explore Dublin. We had a friendly competition going for the most (and unusual) photos of "harp sightings". The only rule was no Guinness logos and gift shop harps, since they are everywhere! It was fun comparing our finds over dinner or during our bus rides. Across the street from Jury's is Christ Church Cathedral, Dublin's oldest building (c. 1030) and still an active church, just ripe for harp sightings and with a fascinating crypt below that was used for the castle scenes in the BBC series "The Tudors." 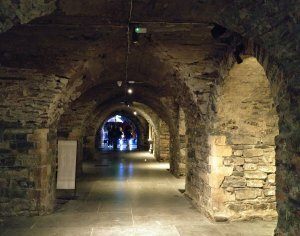 Next door was Dublinia, an interactive museum of Viking Dublin and medieval history. No harp sightings there! Dublin Castle was just down the block and a longer walk got you to St. Patrick's Cathedral, with its own medieval history. 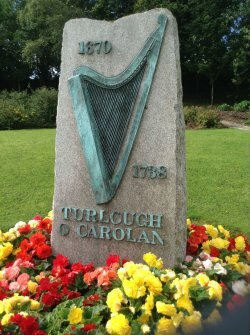 Shyamali Hauth got 23 harp sightings there, including the famous sculpture of Turlough O'Carolan. The National Museums were a 10-minute walk. 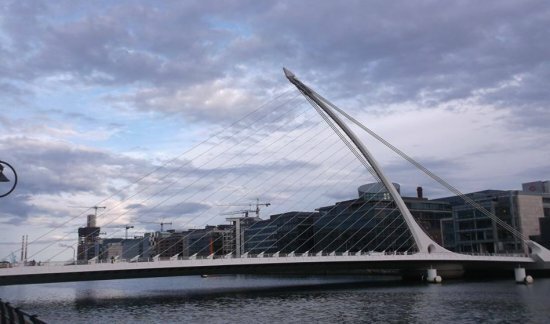 Rich Menges got the biggest harp sighting of the day by walking down to the quay and snapping photos of the Samuel Beckett Bridge, which we dubbed the Harp Bridge. 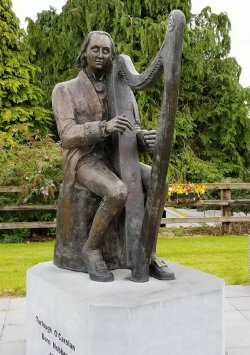 By afternoon our Harpers Haj headed north to Nobber, Carolan's birthplace, where the sighting of the Carolan statue in the middle of the village had 20 harpers calling for Seamus to stop the coach! The fence in front of the statue looked like a music staff with the notes for Bridget Cruise on it. After a special dinner at Nana's Kitchen, we strolled to the 1771 church-turned-cultural center where Nobber native Dearbhail Finnegan gave us a concert. 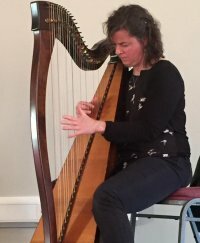 Her Meath Harp Ensemble opened the program with a dozen harps and then she and her flautist husband Robin Slater performed. Of course, Carolan tunes were going to be played! She was then joined by Gráinne Hambly. Gráinne then did a solo and was herself joined by piper Patrick Davey, who came down from Belfast for the occasion. He told the story behind his composition "Flying to the Fleadh", which they played to enthusiastic applause. The concert finale was all the musicians playing together. What a sound! Tea and refreshments, courtesy of Nana's, followed and a session was fated to break out when musicians who only get to see each other on Facebook finally get together in person. It was a mighty night of music. We sang songs the entire bus ride back to Dublin; it started with Irish trad and veered into the Beatles and then show tunes! On Day 4 as we headed out of the city Seamus gave us a final bus tour of Dublin. Our tour stop this day would be the Hill of Tara, an Iron-Age Neolithic archeologic site that came to be seat of the High King of Ireland. 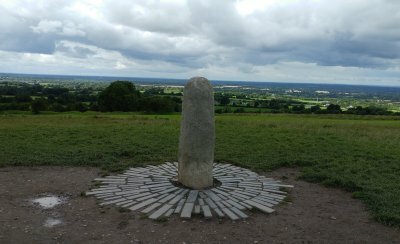 Atop the hill stands the Lia Fáil, the Stone of Destiny, where kings were crowned. All around are ancient earthworks, ring forts and standing stones. It's obvious why it was the "capital" of early Ireland as you can see half the counties in Ireland from this point. Despite holding this strategic vantage point in 1798, the United Irishmen were completely outgunned in the Battle of Tara and were slaughtered on the hill, where some 400 are buried and a monument now marks their mass grave. All that walking and history worked up an appetite so we drove on to Mullingar for lunch. The 2-hour trek to Drumshanbo took us through Kells, Longford, Carrick-on-Shannon and through the countryside to County Leitrim and the Lough Allen Spa & Resort, just at the edge of Drumshanbo, nestled at the southern point of Lough Allen with stunning views of Sliabh an Iarainn and the Arigna mountains. Oh yes. Sí Beag and Sí Mór, the hills Carolan named in his earliest composition were nearby. On checking-in, some wasted no time in scheduling spa appointments for the following "day off" from driving! Another fabulous dinner greeted us and with dessert came a concert with one of Ireland's most notable fiddlers, John Carty, who lives in nearby Boyle, accompanied by his daughter Maggie on banjo and guitarist Frankie Gaffney. Gráinne had come by earlier in the day from her teaching at the O'Carolan Harp Festival in Keadue and brought us more harps so we had quite a few harps for the session with John afterwards. Friday's major Harper Haj #3 was our trek to Carolan's grave in Ballyfarnon, just outside Keadue. Not there since 1980, I took us in the wrong entrance and we had to hunt around before finding his grave. Sans harp, we hummed Fanny Power and left coins, which apparently is the custom. Dennis Gormley left one of our green harp tour pins and then played Lord Inchiquin on his tinwhistle. "The group experience around his grave was very moving," said Gerald Carcione. No visit to Ireland can be complete without learning about the Great Hunger of the 1840s, so we visited Strokestown Park and the Irish National Famine Museum. As we toured the landlord's house, you couldn't help but juxtapose its comforts with the poverty and misery of their Irish tenants, depicted in the museum housed in one of its stables. For many on the tour and on their first trip to Ireland, this was an eye-opening experience. 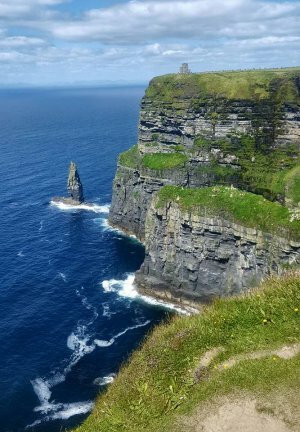 Christine Sauer told me, "I loved this stop as it made Irish history real for me and left me wanting to go home and study up more on that time and what we can all learn from it." Our tour guides Marianne and Seamus had a surprise itinerary stop to follow. Half opted to go back to the hotel and the other half got back on the coach for a trip to the Belleek pottery factory and museum in Fermanagh! More stunning scenery. 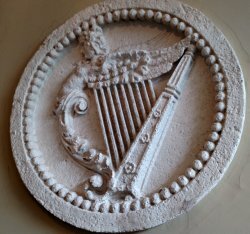 There were harp sightings aplenty in its museum touting the fantastic craftsmanship and artistry of Belleek creations spanning 150 years. The Belleek mark is the round tower, harp and hound. You'll find harps worked into many of aspects of their china, from teapot handles to plates to sculptures using harp motif to porcelain harps. 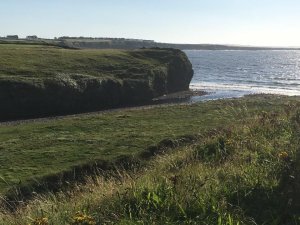 On leaving Belleek, Seamus took us down the coast on the N15, a road sandwiched between the magnificent ocean view in the west with the dramatic Dartry Mountains and legendary Benbulben to our east. We were in Yeats' Country. We stopped outside Sligo for dinner and then another surprise stop, this time at Drumcliff where William Butler Yeats is buried. With Belbulben still in view we then boarded the bus for the journey back to Drumshanbo, where Gráinne already had a harp session in progress. What a way to spend the day! 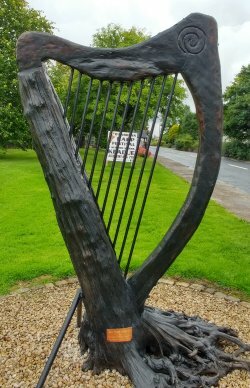 Our stay at Lough Allen coincided with the O'Carolan Harp Festival so on Saturday morning 17 of us, including Gráinne, headed to the harp competitions in Keadue, while others did the spa or explored further afield along the roads and byways around Drumshanbo. We headed back for our own harp workshops that afternoon with Billy Jackson and Gráinne, thanks to the harps they brought for us to play! Others walked along Lough Allen and the countryside, though none came close to the nine miles put in by Lucy Cummin and Lynne Baer up Sliabh Ban. The Gormley-Devines biked and then went to the Arigna Mining Experience. While Emily Greenberg was in workshops, her husband Howard kayaked on Lough Allen. It was a full day for everybody but it wasn't over! Our concert, of course, featured Grainne and Billy, very familiar to all of us, but many were introduced to the fabulous playing of Laoise Kelly. Playing for this audience of harp devoteés lent a special atmosphere to the performance by these wonderful artists, comfortable on their home turf and with the backdrop of Lough Allen. A full evening of some of the best harp playing ever! Carmen Roebke commented, "this concert was worth the price of the airfare!" A rousing session with Gráinne and Billy followed and by this point in the tour we had some definite favorite tunes we could all play together. "All the way to Galway" is the name of a tune and our itinerary for Sunday, traveling through Westport in Mayo and then the Burren region with its moonscape limestone land formations. Seamus took us down along the scenic Atlantic Coast road, lined with red wild fuschia bushes. We headed through wild Connemara to Kylemore Abbey and Victorian Walled Gardens. My sister Ginny and I headed straight for the gardens while the sun was still shining as others headed for the abbey and the church. 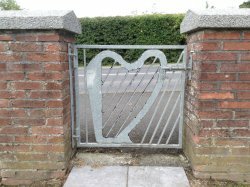 There were harp sightings in those buildings but the garden was the big attraction for us. Gorgeous. We sat outside the cafe to enjoy a lunch of soup and brown bread while watching clouds touch the mountaintop right in front of us. A soft Irish rain followed us as we continued our trip through Connemara hills, out along beautiful Galway Bay and through Salthill, with its beaches and amusement park. Located on Galway's bustling Eyre Square, the Park House treated us like royalty. Debbie Brewin-Wilson called it "the absolute BEST place I have ever stayed in my life. 6 stars!" The dinner was incredible and oohs and aahhs accompanied every dessert being placed on the table. Edible art! We truly needed a walk after dinner and everyone was on their own to explore the Square and the aptly named Shop Street, abuzz on the last day of the Galway Races. 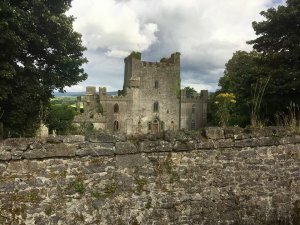 On Monday we headed off the tourist track to County Tipperary to the "most haunted castle in Ireland." 16th century Leap Castle (pronounced Lep) near Roscrea has been the home and perpetual fix-up project for noted tinwhistle player Sean Ryan since 1991. Go ahead and google Leap Castle for all the gory details, literally, or click here or on the photo of the castle here to see one of many TV shows on Leap. Sean himself welcomed us into the main great room where he enthralled us with its long history from the 1500s right up to the Irish civil war. 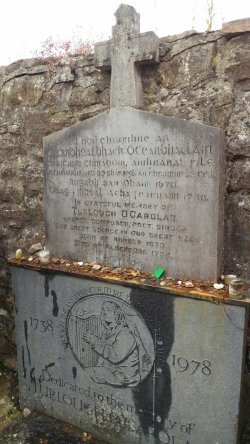 He pointed out that Charles Carroll, the only Catholic to sign the Declaration of Independence, was from the castle's O'Carroll clan. Those who were not claustrophobic ventured up the narrow winding staircase through 3 levels of the castle tower and its rooms up to the Bloody Chapel (google it). Anne Callanan-Ryan told us more stories of the murder and mayhem that took place there and with another room being called the Murder Hole Room you may get why it's haunted, though Sean is quick to tell you that the spirits don't seem to be malevolent. Having descended back down to the main hall, Sean invited us to sit and proceeded to play tinwhistle, accompanied by Conor Harnett on flute and drums. He invited us to join them. Grainne and Lucy had their concertinas and Carmen and I took out the fiddles. Dennis had his flute and Isabel Pontes her tinwhistle. Conor, is also a champion dancer, and in a very small space in front of us, regaled us with some mighty stepdancing to our playing. A lovely bit of music was shared in that ancient hall and even our driver Seamus gave us a song. What a memorable afternoon. Definitely one of the trip's highlights for me and many others. For our last day in Galway we had "time on our own" to explore this friendly, walkable city. Just a walk down Shop Street brought you to numerous historic sites like: a remnant of the original medieval city walls now enveloped by shops, Lynch's Castle (now a bank), St. Nicolas' Church (dating to 1320) with Lynch's Window (where the city's mayor James Lynch "lynched" his son in 1493 as punishment for murdering a Spanish merchant), the Spanish Arch and Galway City Museum down on the river bank. There were street musicians and performances up and down the entire length of the street. Some folks ventured further afield and grabbed a tour to the Aran Islands or walked down the canal to Galway Cathedral. Kathleen Loughnane, who lives in Galway, was our exclusive evening entertainment, accompanied by her son Cormac Cannon (pipes, flute and tinwhistle) and his wife Breda Keville on fiddle. Kathleen's specialty is the harp music of the 17th and 18th centuries and the Connellan brothers in particular. She doesn't often play in the States though many of us had heard her at Somerset last year. The concert was a treat and the lively session that followed was a great way to wind up our time in Galway. Leaving Galway we tried to cram as much sightseeing into our last day as possible, soaking in the scenery along the coast road headed to the iconic Cliffs of Moher. We stopped in Lisdoonvarna for lunch, which seemed only right since we had played the Road to Lisdoonvarna at every one of our sessions! We passed by Doolin Castle and up to Liscannor, where Seamus brought us to a very moving roadside Famine Memorial across from a Famine mass grave site. It was a short drive to the Cliffs on the sunniest, warmest day of our tour with absolutely no rain in sight. 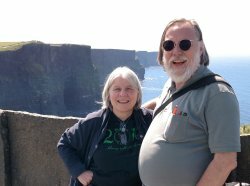 I had never been to the Cliffs of Moher when it was anything but cold and windy. What a stunning view from the top of the 700-foot cliffs over the sea, out to the Aran Islands, and down the coast to Spanish Point, where we'd be staying for our last night. From the Cliffs we made our way down the coast road, stopping for an afternoon pint by special invitation to the well-known Friel's Pub in Milltown Malbay. Our 45 travelers filled the place. Instruments came out. Marianne, who knows nearly every musician, phoned the "locals" and Cherish the Ladies' own Mary Coogan and her husband Bruce Foley and trad singer Anne Rhynne came to join us. Good tunes and songs ensured and even a bit of sean nos dancing! Then it was on to Spanish Point, just 10 minutes away, to stay at the Bellbridge House. We took advantage of the sun to walk on the beach or just hang out on the patio. Our final get-together after dinner was a rollicking good time, even though we only had Cait's harp to share. People took turns playing and the fiddlers and other instruments among us kept things moving. We were joined by Irish fiddle legend Antoin MacGabhann and his lovely wife and sean nos dancer Bernadette. We closed our final evening with the song "The Parting Glass," before heading back to our rooms to pack for an early-morning drive back to Shannon. Over the course of our 10 days together, our little group became quite close-knit. We really enjoyed each other's company driving across the Irish countryside and our drives and meals together were filled with stories and jokes. The music was mighty, as they say in Ireland. New friendships were made. Amidst the final hugs and good byes were vows to see each other again next summer at Somerset and maybe even on the next tour! As Cate Mahoney told me, "I will miss Harpers Escape this October but one door closes and another opens. I had the best time!"